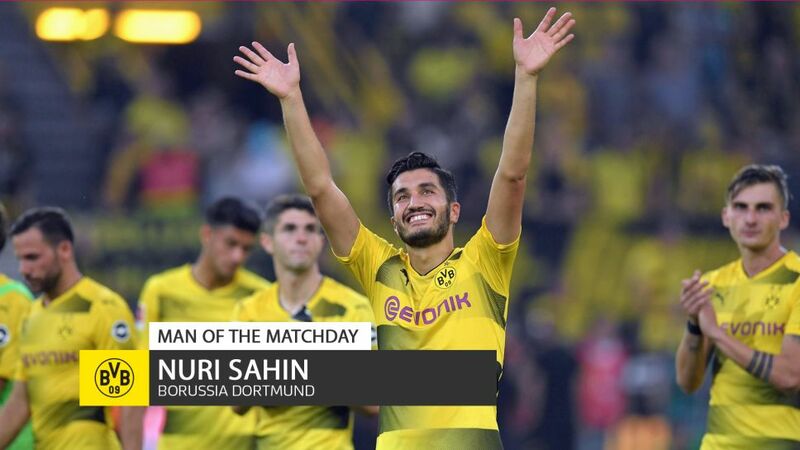 Borussia Dortmund puppet master Nuri Sahin rolled back the years on Matchday 2. Pulling the strings in an all-action display against Hertha Berlin, the Turkey international laid on a goal for Pierre-Emerick Aubameyang for the first time, before putting the seal on a comfortable 2-0 win with a bona fide bolt from the blue. "It's about time I scored again," Sahin smiled, after ending a goal drought dating back to Dortmund's 4-2 victory over Mainz on 13 February 2015. "I don't know myself how often I hit the ball so well with my right foot, but I had a good feeling as soon as the ball left my boot." Those good vibrations went hand in hand with a superlative performance, which can only be categorised as 'vintage Sahin'. The 28-year-old has had his fair share of setbacks since leaving Dortmund for Real Madrid in summer 2011 and returning to the club - via Liverpool - 18 months later, but it is safe to say it is now a case of normal service resumed for BVB's beloved midfield muse. "There's no point talking about the past," Sahin explained. "After last season, I needed to find the right answers. I don't want to be the best or the most important, but I want to be a part of the BVB family. I spoke to the club and the new head coach [Peter Bosz]. After that, it was work, work, work for me. You can see it on the pitch: I've rediscovered my best form." Click here for more Borussia Dortmund news and features.